This week I wanted to do something special considering today is my birthday. I wanted to shine a light on one of my favorite teams of all time. Originally, I was going to go with Jerishow, but after spending all day watching Edge's best career moments on the WWE Network, (WHICH YOU CAN ALSO WATCH FOR THE LOW LOW PRICE OF $9.99), this was a bit of a no brainer. We all know the highlights of these guys. They've been everywhere and done everything. The first to make the jump was Edge who had gotten a tryout for WWF in 1996 and by 1998, he had finally made his TV re-debut with that terrible quiet loner gimmick before starting a feud with Gangrel. 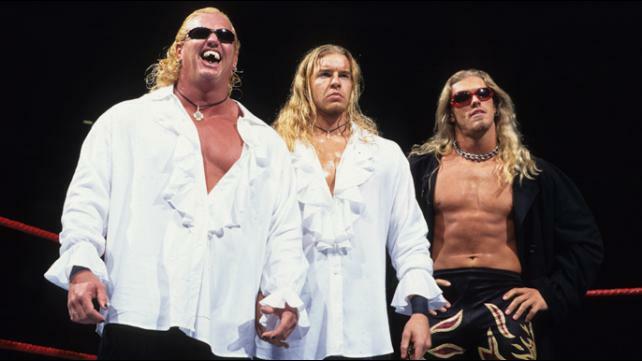 Then shortly thereafter, Christian made his debut siding with Gangrel and Edge would join them to become the Vampire-themed Brood stable. As cool as the entrance, music, blood baths and stuff were, the gimmick was extremely limited and breaking away from it led to us beginning one of the greatest tag team rivalries in WWE History. After breaking up The Brood, Gangrel formed The New Brood with The Hardy Boyz, which of course would lead to a feud with E&C. From there on they gave us the Terri Invitational Tournament which was a best of five series with the winning team acquiring the managerial services of Terri Runnels and $100,000. The Hardyz would go on to win the fifth and final match in the series at No Mercy in a very entertaining Ladder Match. With The Hardyz turning face, it meant that they needed a natural heel foil and that would come from Edge and Christian. During this nearly 2 year long feud (on and off of course), both teams began to cement their status as rising stars. The Hardyz became entertaining through their wild and high-flying style. Edge and Chtistian meanwhile, broke through as heels by mocking other wrestlers and the crowds. 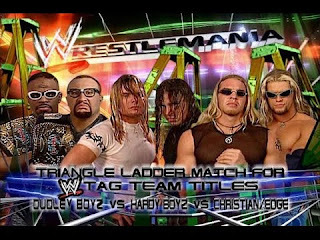 The rivalry between the two teams was boosted with the arrival of The Dudley Boyz and they participated in the first ever Triangle Ladder Match at WrestleMania 2000 for the World Tag Team Titles, which E&C would go on to win. They held the belts until late May, dropping them to Too Cool, but won them back at the King of the Ring PPV. At SummerSlam, they successfully defended the titles in the first ever TLC match against their WrestleMania 2000 opponents. They traded the Tag Team Titles with The Hardyz for the rest of the year and by the end of 2000, they were already 5 Time World Tag Team Champions. 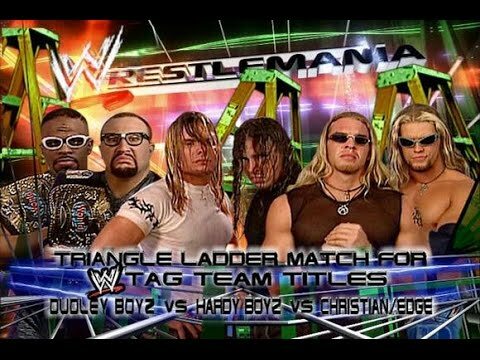 At the Royal Rumble in 2001, they dropped the titles back to the Dudley Boyz, then helped the Hardyz win the titles a few months later and beat them for the belts making E&C six time WWF World Tag Team Champions. However they dropped the titles back to the Dudleys later that night. 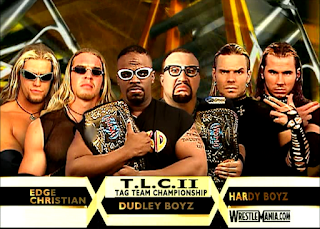 At WrestleMania 17, they defeated the Hardyz and Dudleyz again in TLC II for the World Tag Team Titles making them a record seven time champions. 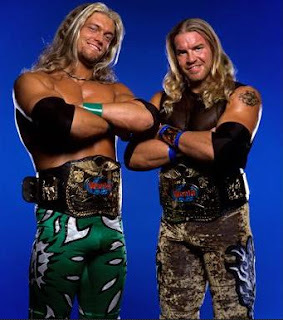 Although they would become undone because of Christian's jealousy of Edge's King Of The Ring win, Edge & Christian really raised the bar and standard (along with the Hardyz and Dudleyz) for what tag team wrestling is. I have to admit that I severely underrated this team because I didn't like them, but that just means they did their job the right way. The best move for them was breaking away from the Brood and becoming the Joker to the Hardyz' Batman. They were absolutely hated for making fun of fans in cities like Boston for the Red Sox's World Series failures, Indiana's Bob Knight incident and just making fun of rednecks in Alabama. Now when you hear people and their memories of those moments, they are funny and a part of what made them great. They always pushed the line of what they could get away with and it showed when they were paired up with Kurt Angle. Before teaming with E&C, Kurt was pretty much a no nonsense kind of guy. Next to those two, and eventually Rhyno, he's doing hilarious backstage segments just about every week and even after the group disbanded. However with good times came the bad. 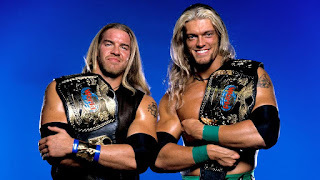 There was a time when Edge said Vince wanted to split them up, but heard them doing commentary antagonizing the wrestlers and decided instead to make them his World Tag Team Champions. So any negative these guys faced was turned into a positive. Not to mention, these guys could go in the ring. They made fun of you and your favorites before the match then beat them in said matches. As well as they both worked together it was clear that they both were destined for bigger and better. So they used this team to launch themselves into midcard champions and eventually, each became World Champion. My favorite thing about them is their ring psychology. They know what works for them and what doesn't and they milk the good for everything it's worth. That's something a lot of guys can learn from. Its like "okay I've done this millions of times before but what way can I kind of freshen it up and make it look good?" That's how you get the ladder spears, the con-chair-tos and Los Conquistadores (which showed what hilarious lengths they would go to in order to win back the tag team titles). It's no wonder why they are a record seven time WWF World Tag Team Champions. Edge and Christian earned their spot as one of the greatest teams ever, and you can clearly see why.